This entry was posted in authors, California Writers Club, ghosts, Jack London, poets, Sonoma County, Writers, writing and tagged postaday. Bookmark the permalink. What is it? After several “guesstimates” via FB, we decided this dark irridescent greenish black foot belonged to a raven or crow. Found it behind our house one day. I’m guessing the owls dropped it as they flew off with their supper. That was very unusual. Looks like something out of a horror movie or something. Thanks, Mark! Yes, it does (did) look like something from a horror movie. Finally had to return it back to mother nature when it started to mildew. Enjoyed your “unusual” photo on your blog. Sounds like quite the experience! Thanks, Nicola!LOVE your creative response to my photo! Gets my “author” wheels turning! Not sure where you live, but in England, we have water birds called “coots”. The adults have very strange looking, semi-webbed white feet – Google “coot foot” in images to get an idea – but the chicks have black feet. Your photo looks similar. They’re not the cutest babies, but check out the feet of the fifth and sixth pictures down …. Thanks, Alice. We’re in northern California. Don’t recall seeing such a bird here. The “coot” link you shared IS a cute little baby bird…..until we get to its feet! You’re right! Very similar feet to the one I found. 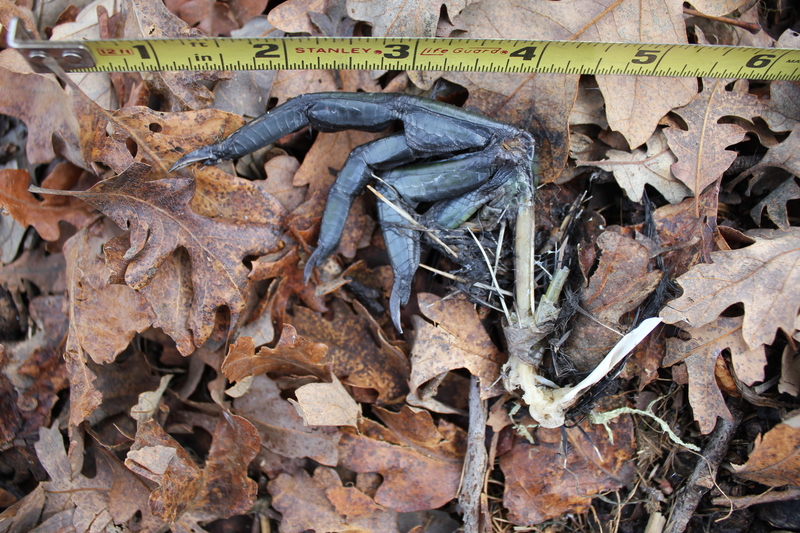 Our best guess on the bird foot I found is that it is from a raven or crow.